Some people say Francois de la Rochefoucauld is the author of this idea. Others give the honors to Heraclitus. Then, along comes Melissa Conway, who wants credit for it. I heard my dad saying it a lot, so in my mind, he’s the creator. People do unusual things to prevent change, but the saying is correct. Empty nest, getting laid off or retirement, moving from one part of the country to another, getting a divorce, you or someone you love becoming ill or being involved in an accident– all of these things change the status quo. What perhaps up til then you’d taken for granted, can be transformed in an instant. How do you handle change? Even more important perhaps, how do you work through unwanted change — change that you didn’t choose? 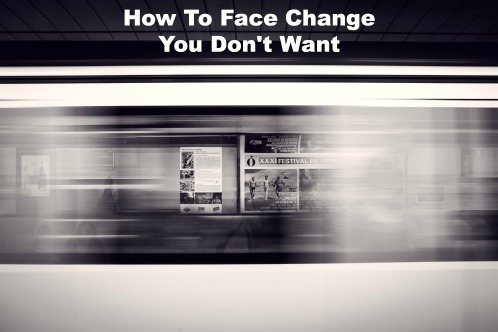 There are plenty of things people do to try to avoid the fact that change is occurring. You can flatly believe that it won’t occur. A poignant example of this is when your spouse has told you more than once how unhappy they are in your marriage, and you deny to yourself that she or he would leave. “She’ll never really do anything.” When she files for divorce, you’re actually floored. You can avoid any facts that might suggest that your reality is not rational. This typically entails putting off the change that is coming, and pretending that, for example, it won’t really be necessary to move, or forgetting to make the cardiology appointment when you’re having tightness in your chest. You don’t get around to making those decisions, and things can get much worse. 4) Living In The Past. We all know people who dress far too immaturely for their age, or who continue behavior that might have been acceptable as an adolescent, but doesn’t fit adulthood. Not moving on and not accepting change is a definite strategy to fend off reality. Many people believe that if they worry about things enough, they can prevent bad things from happening. It goes way beyond thinking ahead, realizing potential problems and creating solutions to those problems. They believe their worry is an actual barrier. So they must maintain it. Perhaps the hardest part about change? 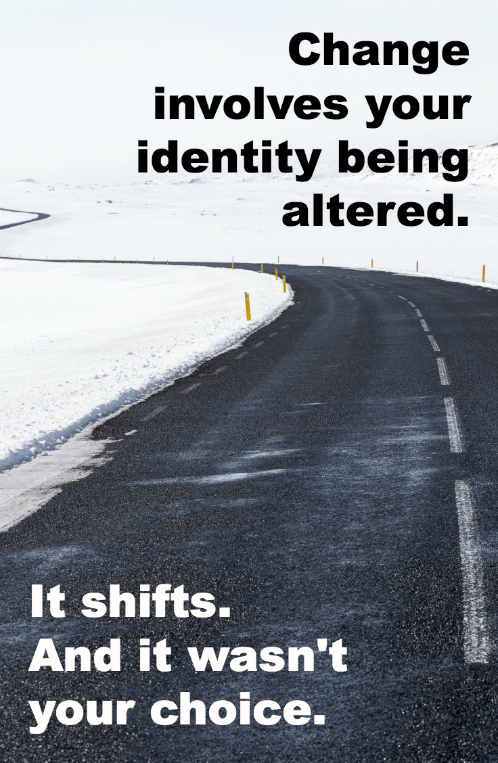 It can involve your identity being altered. And it wasn’t your choice. You were a hands-on mom, now you’re alone in your home. One minute you’re the guy everyone can count on at work — the next you find out you have cancer. Your marriage that you thought would last forever, falls in shambles around you. Yet unwanted change doesn’t have to alter your values. The people who I watch handle sorrow and even tragedy what I’d term “successfully” are people who fight to not let the loss define them. Chad and Lisa were looking forward to the birth of their first child when tragedy occurred. The ultrasound at eights months showed no heartbeat. Other tests confirmed their worst nightmare. The baby had died. Lisa had to actually go into labor, but there was no cry of life at the end. It was six weeks later when I met them. Rage, confusion, grief, numbness — all present. What had been the most joyous of anticipations had turned into despair. I watched both of them, in very different ways, try to hang on to who they knew themselves to be, how they wanted to try to live, and what their values had always been. It was difficult, and took a very long time. Countless people do this every day. Whether its learning a diagnosis, bearing the betrayal of a loved one, experiencing a tremendous sorrow or loss, healthy people fight to not be victimized by loss. Others move past it. The same things happen. But they go on. And that refusal gives them the courage to cope with what they never wanted. But must handle, grieve — and get on with their lives. My heart goes out, as I’m sure yours does, to the people of Baton Rouge who are desperately fighting to retrieve some sanity in their lives — who are facing every day enormous trials they certainly didn’t know were coming, and weren’t prepared for in any way. There are many local and national efforts to help. I encourage you to do what you can. The American Red Cross has put out an urgent call: you can donate by clicking here. If you’d like, SUBSCRIBE to my website and receive my posts weekly in your email! You’ll also receive my free eBook, “Seven Commandments of Good Therapy,” a basic guide to how to evaluate a therapist. You can always privately email me: askdrmargaret@146.66.99.73.